World and religious leaders responded with expressions of solidarity with France after a catastrophic fire engulfed the upper part of Paris’ iconic Notre Dame Cathedral on Monday, caused the roof and spire to collapse. "Notre-Dame is aflame. Great emotion for the whole nation. Our thoughts go out to all Catholics and to the French people. Like all of my fellow citizens, I am sad to see this part of us burn tonight." President Donald Trump: "So horrible to watch the massive fire at Notre Dame Cathedral in Paris. Perhaps flying water tankers could be used to put it out. Must act quickly!" Vice President Mike Pence: "Notre Dame is an iconic symbol of faith to people all over the world – and it is heartbreaking to see a house of God in flames. Our thoughts and prayers are with the firefighters on the scene and all the people of Paris." Former President Barack Obama: "Notre Dame is one of the world’s great treasures, and we’re thinking of the people of France in your time of grief. It’s in our nature to mourn when we see history lost – but it’s also in our nature to rebuild for tomorrow, as strong as we can." House Speaker Nancy Pelosi: "Notre Dame has stood as a beating heart of religion & culture for centuries, inspiring all who have visited her. The footage of today’s fire is nothing short of heartbreaking. To the people of Paris & France: know that America stands with you." European Council President Donald Tusk: "Notre-Dame de Paris est Notre-Dame de toute l’Europe. We are all with Paris today." French Ambassador to the U.S. Gérard Araud: "Notre Dame de Paris. I am crying. Incredibly sad." European Commission President Jean-Claude Juncker: "I am following minute by minute the fire of which Notre-Dame de Paris is the prey. Our Lady of Paris belongs to the whole of mankind. It has inspired so many writers, so many painters, so many philosophers, so many visitors from all over. What a sad spectacle. What a horror. I share the emotion of the French nation which is also ours." Archbishop of Westminster and the most senior catholic leader in England and the Wales, Vincent Gerard Nichols: "The shock at the outbreak of this fire is spreading round the world. It is an iconic building visited by millions but more importantly is a symbol of faith which is at the heart of Europe. We therefore all pray that the fire is extinguished quickly and with a shared effort the building made good." 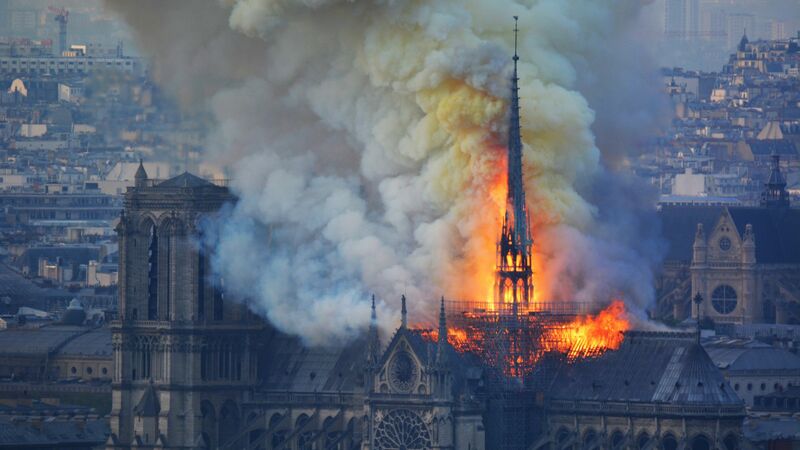 The Vatican: "The Holy See has learned with incredulity and sadness the news of the terrible fire that ravaged the Cathedral of Notre-Dame de Paris, a symbol of Christianity, in France and in the world. We express our closeness with the French Catholics and with the Parisian population. We pray for firefighters and for all those who do their best to cope with this dramatic situation."